You'll finally be able to use your oven for something other than your sweaters. 1. 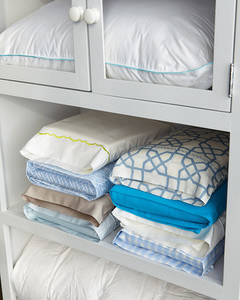 Store your sheets in their matching pillow case or buy a reusable storage bag that lets you move them with ease. Get the storage container on Amazon for $7. 2. 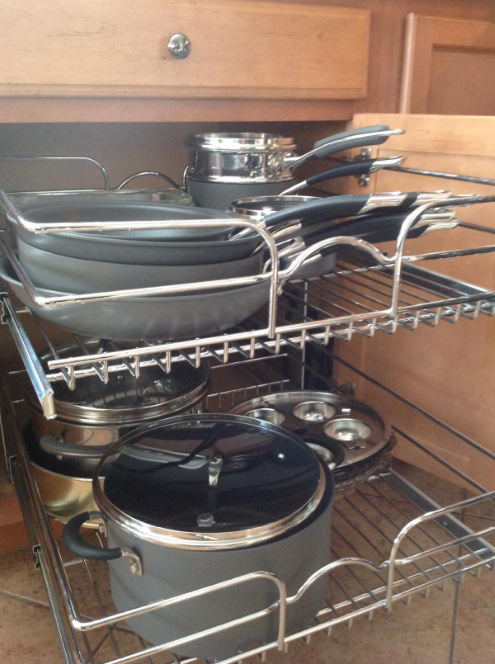 Get sliding racks for your cabinets to store food, dishes, and cookware. Get this one on Amazon starting at $81. Available in 12", 15", 18", and 21" options. 3. 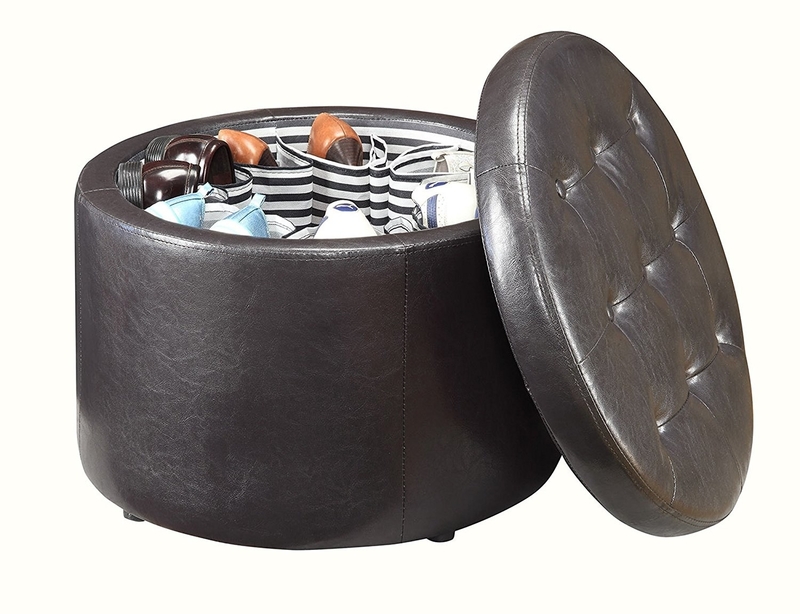 Get an ottoman that includes a storage compartment to create extra space in the middle of any room. Get it on Amazon for $53. Also available in beige, black, and green. 4. And place a bench with open storage in your entryway for easy access to the things you need when you're running out the door. Get it on Amazon starting at $50. Available in white, espresso, and cherry. 5. 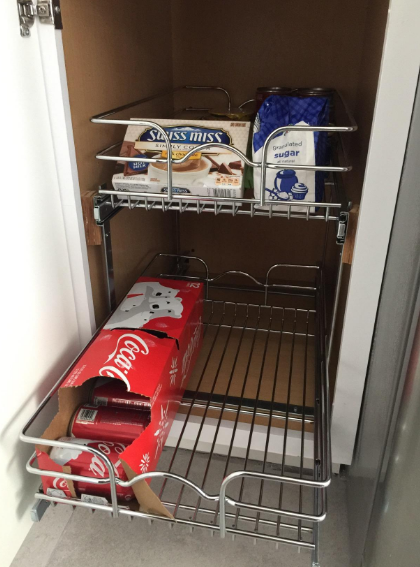 Create under-sink storage with adjustable shelves that fit around your pipes. 6. 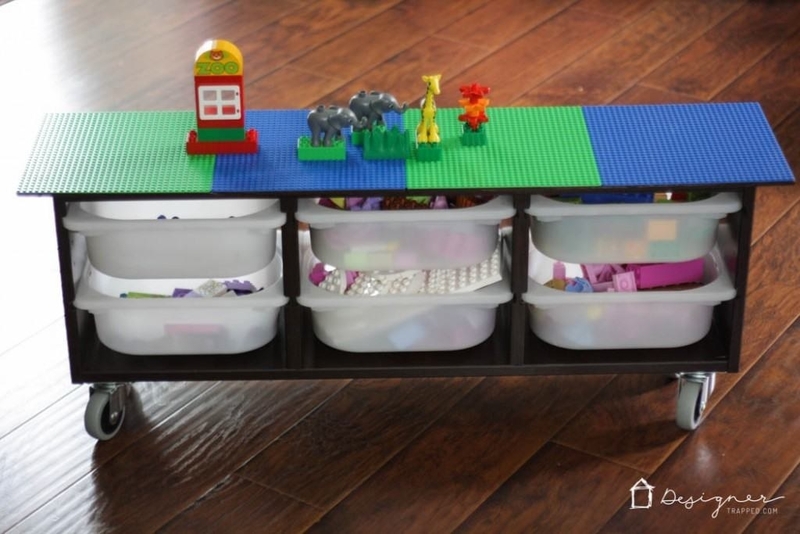 Get your kids organized with storage bins that can be easily pulled out during play time. 7. 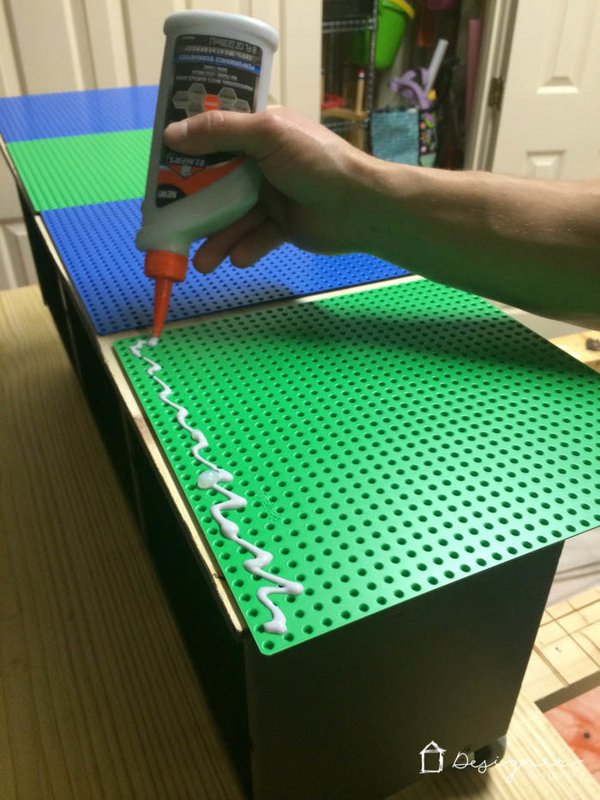 And DIY a lego table with storage so they'll always have a place for their favorite toys. Get the full tutorial from Designer Trapped in a Lawyer's Body. 8. 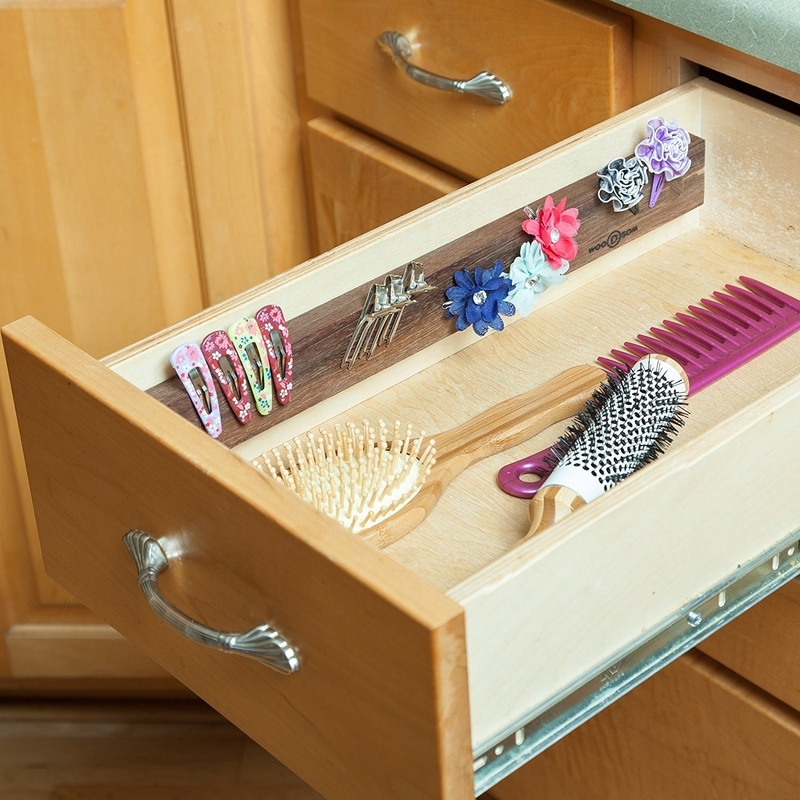 Use a magnetic strip to store your hair supplies or tools within reach. Get this one on Amazon for $40. 9. Use your garage door to store your ladder and electrical cords with easily attachable hooks. Best part, your garage door will still operate even when they're on. 10. Add shelving to any wall to create more storage throughout your home. Get these shelves at Urban Outfitters starting at $10. Or make your own with this tutorial from Designer Trapped in a Lawyer's Body. 11. 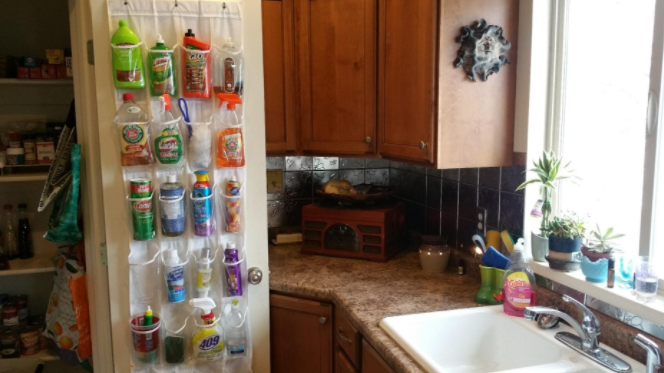 Store all your hair supplies in one neat, organized place with a holder that hangs off your cabinet door. Get it on Amazon for $18. 12. Build up your cabinets to the ceiling for additional kitchen storage. 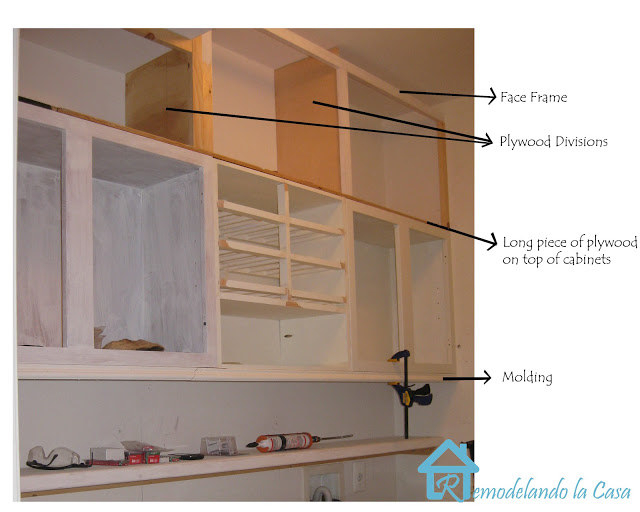 Get the full tutorial from Remodelando la Casa. 13. Get a full-length mirror that doubles as jewelry storage. Get it on Amazon for $95. 14. Use a shoe organizer to keep your cleaning supplies, pantry snacks, kid's toys, or even your shoes in one, easily accessible, place. Get this on on Amazon for $9. 15. Or, keep those cleaning supplies and pantry snacks on a slide-out storage tower. Get the three-tier version for $25 and the five-tier version for $50 on Amazon. 16. Use adjustable hooks throughout your home and position them to the side in smaller rooms to utilize less space. 17. Create under-sink storage for your sponges and brushes with concealed trays. Get them on Amazon starting at $18. Available in 11- and 14-inch options. 18. Or, just hook a shelf to your cabinet door to store extra sponges, brushes, and even paper towels. 19. Use your foot ottoman to store your footwear. Available in white, brown, and tan options. 20. Add exposed shelves to your kitchen island, giving you easy access to and a way to showcase your beautiful dishes. Get the full tutorial on Remodelando la Casa. 21. 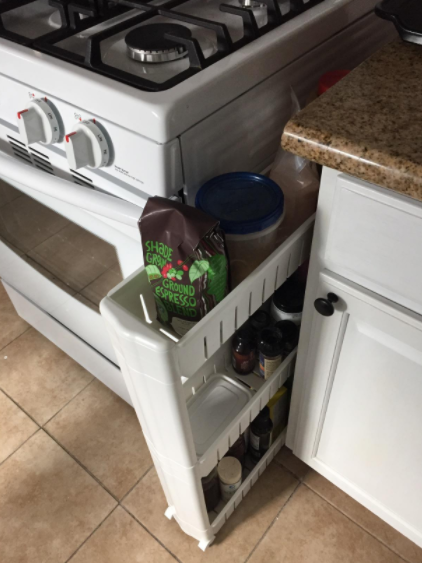 Get a compost bin that's easily stored under your sink. 22. 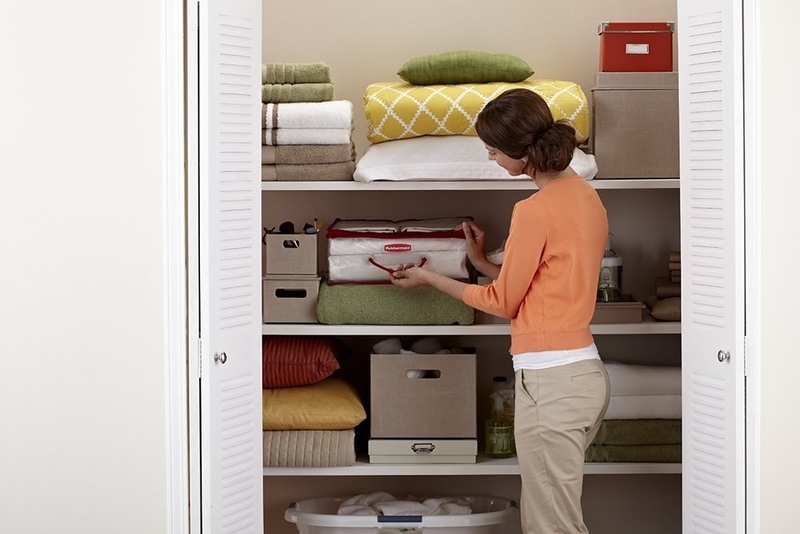 Utilize the space under your bed with fabric storage bags that'll protect your things and maximize the area. 23. 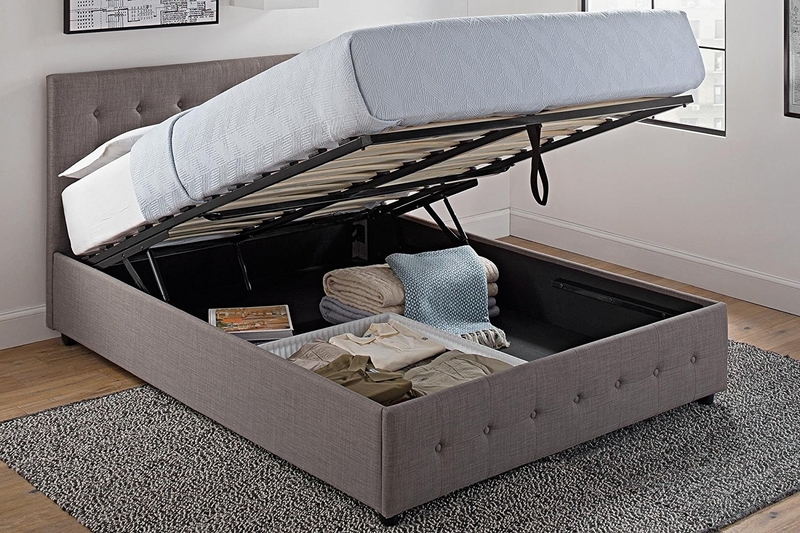 Or invest in a whole new bed that discreetly stores all those extras you want out of sight. Get it on Amazon starting at $320. Available in full and queen bed options and in black. 24. 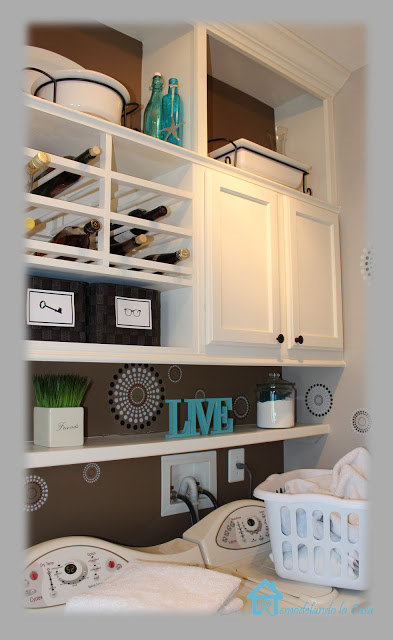 Mount a towel rack to any wall to store your wine (or towels, I guess). 25. 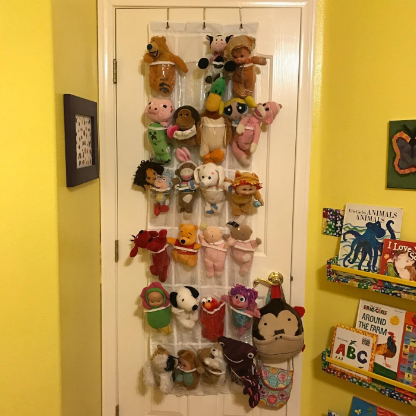 Hang a shelf-and-hook combo. Bonus if it has picture frames like this one! Get it on Amazon starting at $23. 26. 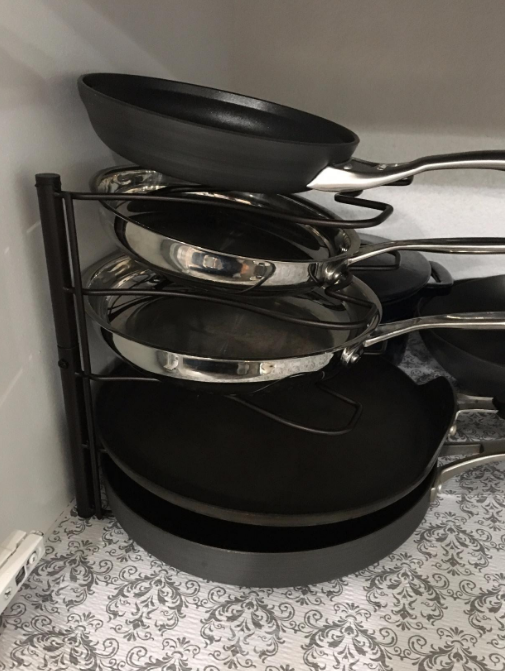 Mount a pot-lid rack to your cabinet doors. Get this one on Amazon for $16. 27. 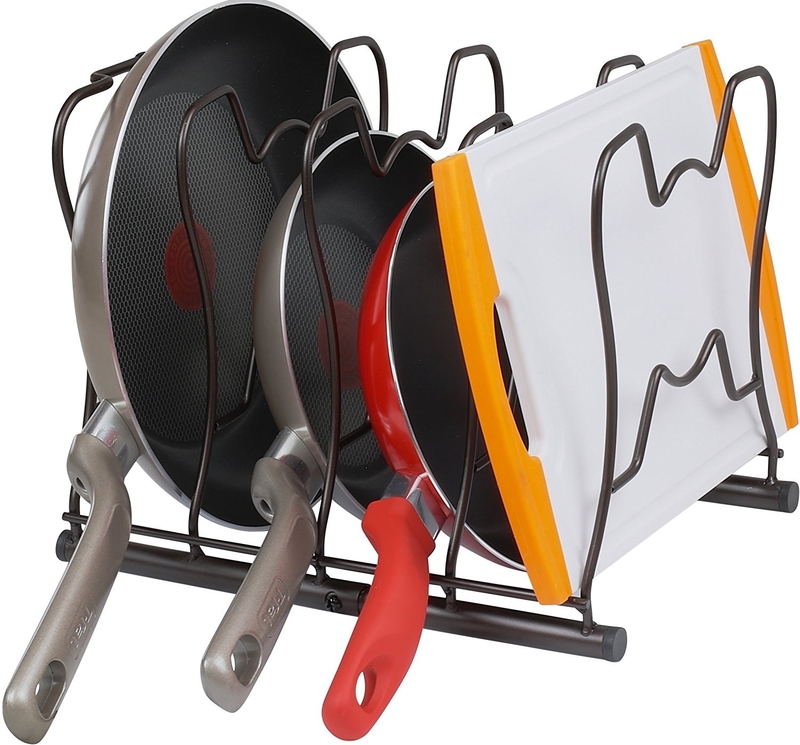 And store your pans on a rack to maximize storage space and protect their non-stick surfaces. Get this one on Amazon for $15. 28. Pour your dry foods from mountable food containers. 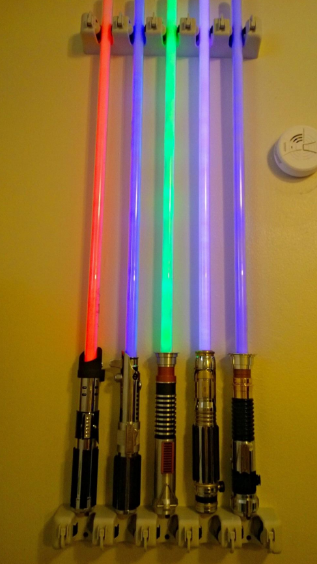 Get a set of three on Amazon for $35. 29. Keep your baking sheets in a place (that isn't the oven) with a basket that can be mounted or hung on your cabinet door. 30. 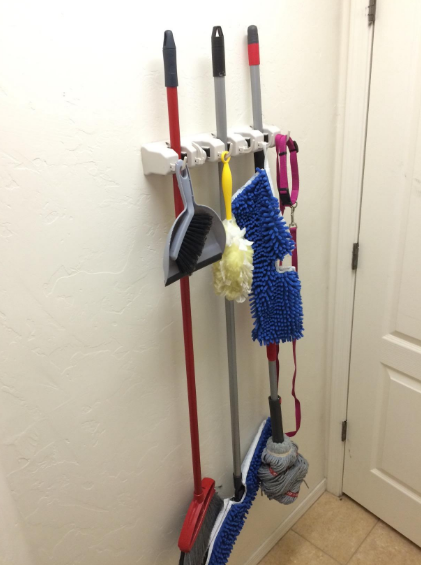 File away all your cleaning tools — or light sabers — with a broom holder. Get this one Amazon for $11. 31. 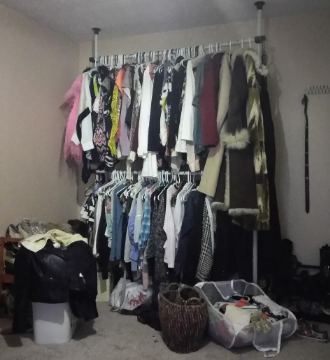 Plant an extra closet nearly anywhere with these adjustable clothing racks that suction to the floor and ceiling. Get it on Amazon for $70. 32. 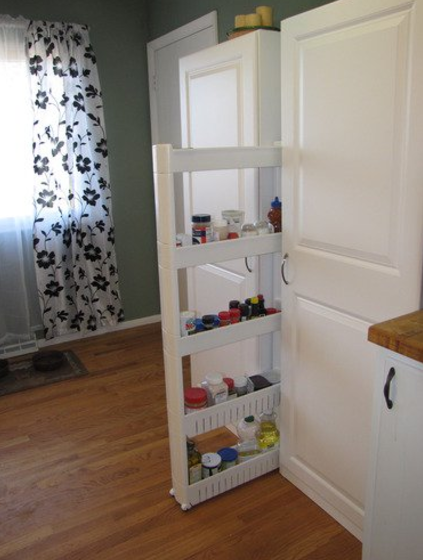 Store and organize those hard-to-reach cabinets that have unused space with a pull-down spice rack. Get this one on Amazon starting at $12. Also available in white and clear. 33. 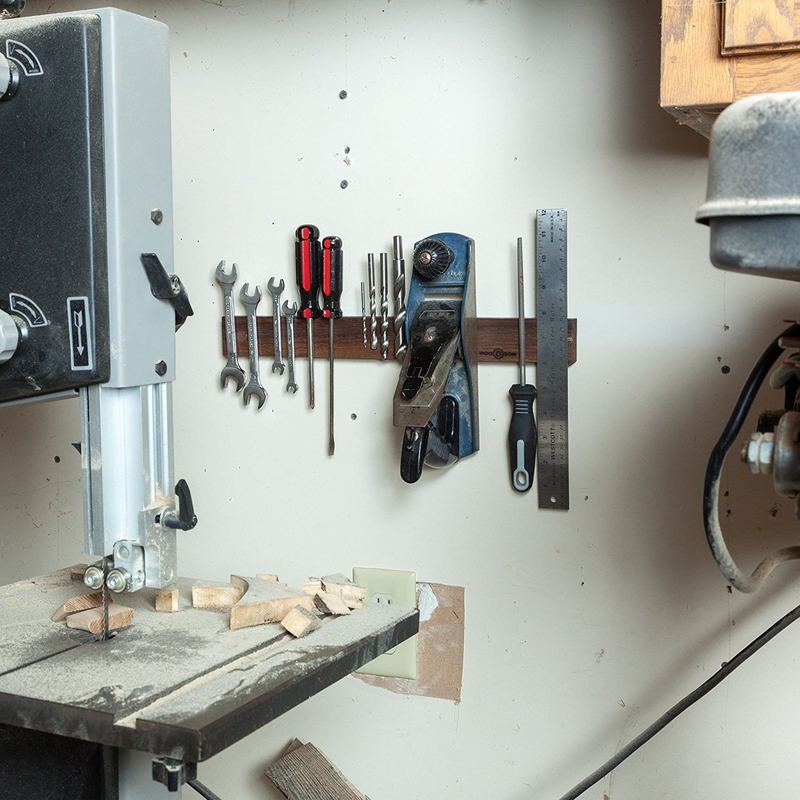 DIY a custom desk with plenty of shelving to get all the storage you'll need. Get the full Tutorial at The House of Smiths. 34. 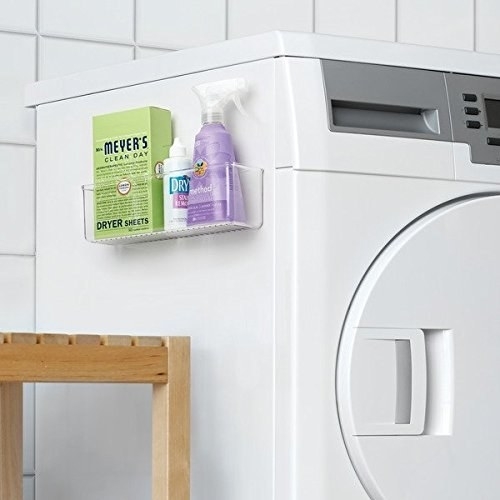 Attach small containers to the side of the washer and dryer to store all your laundry supplies. Get it on Amazon starting at $10. Available in a variety of sizes and depths. 35. 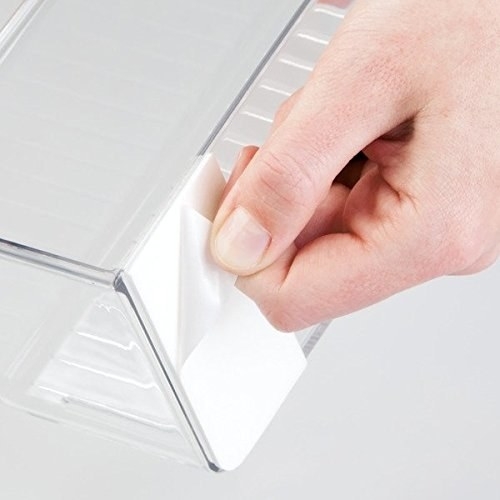 Have a place to store all your plastic bags with a super easy hook that clips onto your cabinet. 36. And utilize every inch of space with a storage cabinet that mounts to the hinges of your door. Get it on Amazon starting at $137 or DIY one with this tutorial from Remodelando la Casa. Also available in espresso and for wine storage.